Auxin is the first plant hormone to be discovered and probably the best known of all plant hormones. It plays a major role in the regulation of plant cell elongation and in the growth responses of plants to unidirectional stimuli, known as tropism. Discovery of auxin is attributed to Charles Darwin and his son Francis who studied photoperiodism (bending of plant shoots toward light). In some experiments Darwin used seedlings of canary grass (Phalaris canariensis). The young leaves of the plants were sheathed in a protective organ called coleoptile. The coleoptiles are very sensitive to light and if they are provided light from one side for several hours, they will bend (grow) towards the source of light. Darwin’s found that tip of the coleoptile perceives the light. Because when the tip was covered with thin foil, the coleoptile did not bend. It was observed that the region that is responsible for bending towards the light (growth zone of the coleoptile) is present several millimeters below the tip. Thus, they concluded that some sort of growth signal is produced at the tip that travel to growth zone and causes the shaded side to grow faster than the side facing the light. Frits Went in 1926 demonstrated that a growth promoting chemical, later named auxin, was present in the tip of oat coleoptiles. If the tip of a coleoptile was removed, coleoptile growth is ceased. Went’s major discovery was that the growth promoting substance diffuse into agar blocks. If the tips are removed from the coleoptiles and placed upon the agar blocks. When these blocks were placed upon the decapitated coleoptiles, the growth resumed. If an agar block was placed on one side of coleoptile stump, the coleoptile bent away from the side containing the block. This curvature occurred because the increase in auxin on one side stimulated cell elongation, and the decrease in auxin on the other side caused a decrease in growth rate. Went found that he could estimate the amount of auxin in a sample by measuring the resulting coleoptile curvature. This technique is called the Avena curvature test, because went used Avena sativa coleoptiles. F. Kogl and A. J. Haagent-Smit and Kenneth Thimann led to discovery that auxin is Findole 3 – acetic acid (IAA). There are several other naturally occuring auxins in higher plants such as 4 – chloro-indolacetic acid, c, (4-chloro IAA) and phenylacetic acid (PAA), but IAA is the most important. Many different synthetic auxins, for example naphthalene acetic acid (NAA), indolebutyric acid (IBA), 2,4 – dichlorophenoxyacetic acid (2, 4-D) have also been produced in the laboratory. In addition to free auxins, higher plants contain auxins covalently bonded to other compounds. These are called bound or conjugated auxins. These include esters of IAA with glucose, amide conjugate such as IAA-N-aspartate, IAA-glucan and IAA-glycoproteins found in cereal seeds. These are first broken to free auxin and then act. Environmental stimuli such as light and gravity influence the release of bound auxins. The bounds auxins may have a number of other functions, including the storage, protection against oxidative degradation and transport of IAA. Another class of synthetic auxins is anti-auxins but specifically inhibit the effect of auxin, for example alpha-isobutyric acid or PCIB. The primary sites of auxin synthesis are apical meristems, expanding leaves and developing fruits since the highest concentrations of free auxin in the living plant are found in these regions. In green plants highest concentrations of auxin is found in apical bud and young leaves. Basal parts of the stem contain the lowest concentration. There is no evidence of synthesis of auxin in root. It seems that auxin is transported to root from the stem. The exact mechanism of IAA biosynthesis is still uncertain, although in most IAA is synthesized from the amino acid tryptophan. The following steps are in synthesis of indole acetic acid. The amino group and the terminal carboxyl group from the side-chain of tryptophan is removed and amino group is denoted to alpha-ketogluteric acid to form indole 3 – pyruvic acid. The indolepyruvate is decarboxylated to indole 3 – acetaldehyde. Finally the indole 3 – acetaldehyde is oxidized to indole acetic acid. Indole acetic acid is oxidized when exposed to light (photo-oxidation) and its destruction is promoted by plant pigments such as riboflavin. The auxin transport plays a significant role in the regulation of plant cell growth and differentiation. It may be active polar transport or passive non-polar transport. In case of active polar transport auxin moves from the apex to the base (basipetal direction) with the help of metabolic energy, for example in coleoptiles and vegetative shoot apices. The normal transport in stems and petioles is from young leaves and through other living cells, including phloem parenchyma cells that surround vascular bundles. In mature leaves the auxins are transported through phloem and this transport does not involve expenditure of energy, therefore, called passive non-polar transport. Cell Elongation: Auxins promote elongation growth in young stems and coleoptiles. When the source of auxin is removed from these tissues, their growth rate decreases. It has been observed that an optimal auxin concentration is required for elongation growth as high levels of auxins may inhibit growth. Auxins causes loosening of cell wall in coleoptiles and young developing stems. It has been observed that auxin causes cells to export hydrogen ions (protons) actively into the cell wall region. This results in decrease in pH and activates wall loosening enzymes. The enzymes in turn promote the breakage of cell wall bonds increasing the wall extensibility. Young leaves are a rich source of free auxin for the growing plant. The auxin may regulate the growth of leaf veins, but its role regulation the leaf growth is poorly understood. Tropism – Responses to Stimulus of Light & Gravity: Auxin meditates the effect of light and gravity on plant growth. Plant responds to a change in their environment and exhibit growth towards or away from the stimulus. An early explanation of involvement of auxin in phototropism is provided by Cholodny-Went theory. According to this theory the phototropic stimulus results in unequal lateral distribution of auxin at the tip. 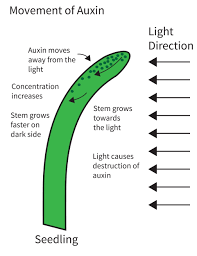 The auxin concentration is higher on the shaded side that on the illuminated side. This lateral redistribution results in differential growth and causes curvature or bends towards the source of light. The curvature in response to gravity is the result of an increase in growth rate on the lower side of the horizontal coleoptile and decrease on the upper side. Apical Dominance: It is commonly observed that apical bud of many vascular plants is very active in growth and lateral buds remain inactive. This observance led to the conclusion that apical bud inhibits the growth lateral or axillary buds to varying degrees. This phenomenon was named apical dominance. Removal of shoot apex (decapitation) usually results in growth of one or more of the lateral buds. It was observed that apical bud contains much higher auxin contents than the lateral buds. Skoog and Thimann proved experimentally that lateral buds resumed, growth as apical buds were removed, but when agar blocks containing auxin were placed on the decapitated tops, the lateral bud growth was inhibited once again. Thus, proving that auxin is responsible for apical dominance. Formation of Lateral Roots: Optimal auxin concentration in primary root inhibits elongation growth, but high level auxin levels stimulate initiation of lateral roots and adventitious roots. Adventitious roots develop from a part of the plant other than the root. They can originate from a group of mature cells that renew cell division activity. These dividing cells develop into a root apical meristem which give rise to new root. Also auxin accumulates just above any wound site in shoot and root where it promotes the formation of adventitious roots. The effect of auxin on root initiation has been very useful for the propagation of plants by cuttings as in Rose. Also auxin enhance the survival of aerial plant parts after damage at or below ground level by initiation of adventitious root formation. Delay in Leaf Abscission: The shedding of leaves, flowers and fruits from the living plant is known as abscission. Before the abscission of a plant organ, a layer of tissue is usually formed at the base of the organ, this layer is called abscission layer. During leaf senescence (aging), the walls of the cells in abscission layer are digested, which cause them to become soft and weak. The leaf eventually breaks off at the abscission layer due to stress on the weakened cell walls. Indole acetic acid (auxin) delays the early stages of leaf abscission and promotes the later stages. If auxin is applied during early stages of leaf abscission, the leaf drop is inhibited. However, during later stages auxin application promotes abscission. This is probably due to synthesis of ethylene which promotes leaf abscission. Young leaves are less sensitive to ethylene than older leaves. Fruit Development: The auxin is involved in the regulation of fruit development. Auxin is produced in pollen, endosperm and embryo of developing seeds. The initial stimulus of fruit growth may result from pollination. Successful pollination initiates ovule growth, which is known as fruit set. After fertilization, fruit growth may depend on auxin produced in developing seeds. The endosperm may contribute during the first stage of fruit growth and the developing embryo may take over as the main auxin source during the latter stages. In some plant species, seedless fruits may be produced naturally or by treating the unpollinated flowers with auxin. The production of such seedless fruits is called parthenocarpy. Auxin may act primarily to induce fruit set, which in turn may trigger production of auxin by certain fruit tissues to complete the development of the fruit. The auxin have been commercially in agriculture and horticulture. The early commercial uses include rooting of cuttings for plant propagation, promotion of flowering in pineapple, prevention of fruit and leaf drop, induction of parthenocarpy and thinning of fruit. Now-a-days auxin are widely used as herbicides, i.e., weed killers. Synthetic auxins are more effective because they are not broken down by the plants as quickly as indole acetic acid.